I recently asked my readers how they made their guacamole so we could have a little fun in the weeks leading up to one of the biggest snacking day of the year, the Super Bowl. 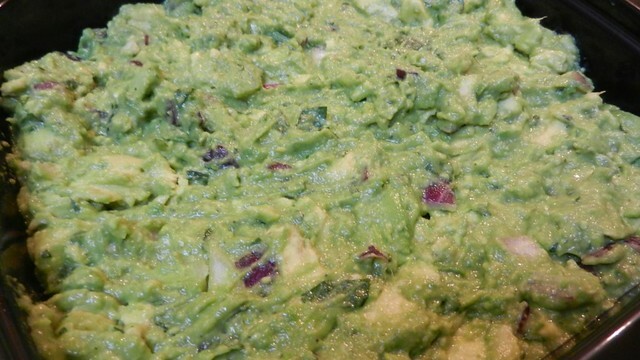 It was going to be Super Bowl Guacamole Week, but then I received more than a week’s worth of recipes and it blew up into an extravaganza of avocados. 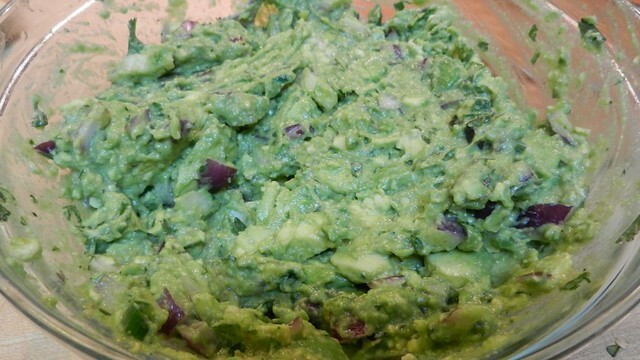 I have to apologize to Dan for the lack of glamor shots of his guacamole in this post. We made this batch to take to a Championship Sunday party yesterday figuring I could take a well-lit picture of the dip at our friend’s house. By the time I went to take a picture of Dan’s guacamole, it was already gone. Probably a little less than half a red onion for 3-4 avocados. Excuse me lack of measurements, probably a couple of salsa bar containers of salsa verde. I’d use very little jalapeño (less than one), just because I prefer my guac to be richer than it is spicy. 2-3 dashes of hot sauce. I also like the salsa verde because it’s liquid-y, I prefer the chunks to be in avocado form, not chunks of tomato. Just a personal preference. Dan didn’t provide directions (understandable, as we should all know how to make guacamole by now), so here is my technique for this particular batch since Dan said he liked his guacamole to be chunky. In a bowl, combine 1/2 a minced red onion, chopped cilantro, a small amount of jalapeno and salsa verde. 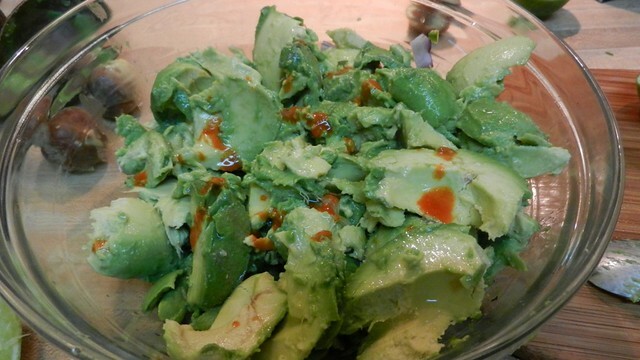 Add 3-4 avocados, the juice of 2 limes and a few hits of hot sauce. Fold together until just shy of desired avocado chunkiness. Season with salt until pepper to taste and mix to desired consistency. As a side note, my two go-to apps with guac are either quesadillas cut into triangles (a good pepper jack works well, with the bite of the cheese and the richness of the guac) or rolled and baked taquitos (ground taco meat, cilantro, onions, lime and hot sauce inside). I use corn tortillas, either steamed or microwaved first, then rolled and put on a slick cooking sheet and put in the oven until crispy. Luck isn’t needed with Dan’s guacamole. The dip is as sure-fire as they come. 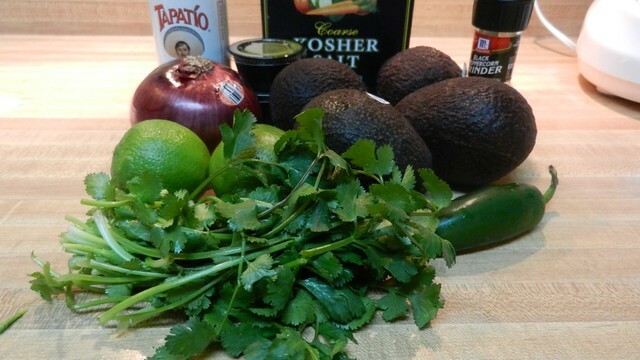 Tomatillo salsa and hot sauce give guacamole a smooth consistency, brightness and heat to the creamy avocados. Probably a little less than half a red onion for 3-4 avocados. Excuse me lack of measurements, probably a couple of salsa bar containers of salsa verde. I'd use very little jalapeño (less than one), just because I prefer my guac to be richer than it is spicy. 2-3 dashes of hot sauce. In a bowl, combine ½ a minced red onion, chopped cilantro, a small amount of jalapeno and salsa verde. 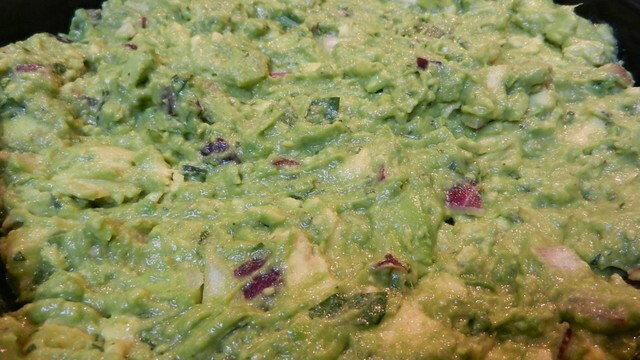 I seem to be dolling out the five-stars pretty frequently for the guac, but seriously: SO MUCH GOOD GUACMOLE. This one disappeared literally before our very eyes at the party we went to. I may have witnessed double-dipping, even. Maybe. At any rate, this was spicy (how I like it, as opposed to how my better half appreciates it) and creamy. Highly recommended.